Setting guidelines around kids' tech use starts with the habits and conscious choices of parents. Mark Bertin, MD, shares tips on how families can be mindful with their tech. Kids and screen time cause considerable parental angst these days—and for good reason. Research shows children spend on average seven hours a day glued to computer, tablet, smartphone, or television screens. This reality has created such a stir that in the fall, the American Academy of Pediatrics (AAP) updated its decade-old recommendation on childhood screen time. Far from a radical revision, the guideline newly suggests a little well-chosen time is fine starting near eighteen months, when used interactively with a care taker. Below eighteen months no time remains best, apart from maybe video conversations with grandparents. From two to five, an hour daily maximum is recommended, and for older kids, two hours total time tops, no different than before. Why is screen time such a uniquely charged and challenging topic? Guidelines of this type are tough to implement in the real world. Kids don’t want to hear that outside of homework too much screen time actually impacts healthy development. However, since children lack mature executive function, cognitive skills required to manage life like a grown up, wise decision-making around screens remains limited until they learn better. As strong a pull as children feel, healthy technology use relies on parents. Executive function is like the CEO of our lives. Anything regarding organization, planning, anticipating, focusing, and regulating behavior relies on executive function. Healthy development of executive function in early childhood has even been linked to life-long academic and social success. In large part, kids depend on parents to manage life while waiting for executive function to mature. Executive function represents the path toward complex problem solving and goal setting, and the ability to defer short term gratification for long term gain. The unsettling reality is that executive function doesn’t fully mature until around the age of thirty. That’s one reason kids and teens make not-so-smart decisions when it comes to social media. In a nutshell, even an independent-seeming teenager almost certainly lacks the full capacity to make long-sighted choices. Immature executive function is a large part of what makes kids act like, well, kids. Around screens, think of it this way: Most adults have fully developed executive function and a strong ability to manage attention, prioritize, plan, and control impulses, and consider the future. They still struggle to keep phones and devices from becoming a distraction. What does that mean for the average child? Because children lack the self-management capacities of a mature adult, they are particularly at risk when it comes to screens. For many, whatever feels best right now (I’m bored, where’s my tablet?) trumps health and well-being virtually every time. For teens immersed in their complex social world and drive for independence, volatile hormones and emotions create a perfect storm when joined with immature executive function and a smartphone. Sending naked selfies—hey, why not? The part of the brain responsible for reflection and foresight isn’t all grown up yet! Like parents through the generations, our modern role is to love our kids, guide them, and teach them. Kids have always needed supervision, and there’s nothing unique about their fascination with technology. Parents before us managed a child’s behavior around driving, partying, curfews, and manners, and we now must keep track of technology, too. This means setting boundaries and giving them more independence as they earn it over time, not before. Short- and long-term attention and executive function suffer. Laser-like attention towards a screen is an illusion; kids remain engaged because their attention constantly, actively shifts. That’s why it’s fun. Increased time in front of screens has been linked to long-term worsening of focus. Short-term use—like playing games on the school bus—has been linked to immediate decreases in executive function. Sleep becomes disrupted. Studies show we all benefit from at least an hour without screens prior to bed. If you’re someone who falls asleep with the TV, you’re distracting yourself from restlessness but probably not helping yourself fall asleep. Screen time can interfere with language, communication, and other forms of social engagement. Background television in homes has been linked to shorter social interactions. Even just having a phone on the table in a conversation has been shown disruptive. “Educational” DVDs used in one study not only failed to work—they caused language development to slow. Particularly in younger children, screen time should be an opportunity to engage, not disengage, with others. Screen time breeds behavioral difficulties. One study showed nothing more than cutting inappropriate media content in preschool homes leads to better school behavior. In another, violent video games in teens were shown to decrease activity in parts of the brain that respond to violence. Of course, not every child playing video games gets swayed, but over any group of children there seems to be an influence. Mindfulness means living life with more awareness and less reactive habit. For a parent, that means not trying for perfection but taking the time to monitor and readjust often. As children need our guidance around any other area of health, they need it with technology. If there’s one takeaway point around the entire body of technology research it is this: Strong parental involvement moderating screen time in and of itself correlates with academic, behavioral, and social success. Strong parental involvement moderating screen time in and of itself correlates with academic, behavioral, and social success. Staying involved means pushing back against mindless screen habits. The role screens play in life is driven by buckets of research and advertising dollars, an industry itching to make more and more money. Wherever technology helps, educates, or entertains in a balanced way, that’s perfect. When its use is driven by boredom, fear, or compulsion, mindfulness means pausing and redirecting our behavior. Nothing much has changed through the years about how children develop or the role of parents. You wouldn’t let a child eat chocolate cake at every meal and you wouldn’t let them drive recklessly. By the same token, you can’t let them use screens without limits. Parenting in the digital age means the same thing as in the stone age: Children require affection, firm limit setting, and a mindful, aware, clear-sighted approach to guiding them, from sticks and stones through television and smartphones. Start with yourself. Children learn an awful lot just from watching their parents, and 70 percent of today’s kids feel their parents are on their screens too much. When you’re with your kids, try to put down your device and pay attention to your family. You are the first role model for screen use. Parents decide how much. For all the debate about how much time is healthy, it comes down to parents prioritizing what they want to prioritize. Take a daily calendar, and fill in everything you value first. Start with bedtime, school hours, homework, reading, exercise, outdoor time, after-school activities, and down time for open-ended play. Whatever is left after that exercise is the maximum available time for screens, without exceeding the AAP guidelines. (An online tool to figure this out is available here). Another trick is to ask yourself: What percentage of unscheduled down time goes directly to a screen? What percentage of unscheduled down time goes directly to a screen? Parents decide when. Set guidelines around homework, meals, and a screen bedtime. Use allotted times wisely, scheduling so you can get what you need done around the house. Teach courtesy and manners too—meaning, when there’s an actual person around we pay attention to that person. One practice to stay engaged with others is taking a deep breath first when the phone rings or vibrates, pausing before deciding if it needs immediate attention. Parents monitor content. The Internet can be an incredible, healthy, helpful source of information for curious kids. It also can expose them to much that is developmentally inappropriate. A handful of games may educate, plenty more clearly do not. Sites such as a Common Sense Media provide unbiased information for parents about what is age appropriate around various games, shows, and movies. Keep computers and screens out of bedrooms so you know what your kids are doing. Use content filters, teach healthy use, and keep an eye on overall habits. Aim to stay a wise, involved parent. Remember that screens are a privilege, not a right. In generations past, kids used the family car responsibly and kept to curfew, or else there were consequences. Technology is no different. If children don’t follow family rules, there’s nothing wrong with a similar result—you’ve lost the privilege of your phone for the weekend. To disconnect for a time won’t destroy their social lives any more than getting grounded did all those years ago. Make active choices. Awareness is the core of mindfulness, stepping from autopilot into active decision-making. For example, a trend has grown to give every middle school student a smartphone, although most parents realize how disruptive they often are at that age. Most experts think high school a better time for a smartphone, but the trend lives on. Around that choice or any other, pause, note what’s driving your experience, and then decide what you think best. 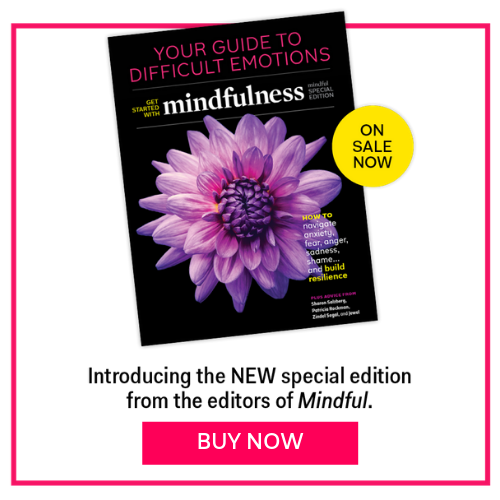 This article originally appeared on The Garrison Institute, one of Mindful’s partners. See the original article.